At NYC Health + Hospitals/Sea View, we recognize that each individual’s needs are unique. That’s why we design a customized rehabilitation treatment plan for each patient. Our teams of highly skilled clinicians, therapists, rehabilitation specialists and other support staff use state-of-the-art equipment and advanced techniques to help individuals recover from an injury, illness or surgery in a friendly, welcoming environment. 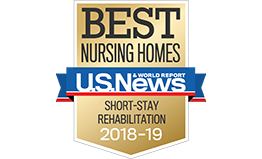 Our Skilled Nursing Facility offers long-term care and support for people who can no longer manage their physical, emotional or mental conditions at home. We are the “home away from home.” In addition to expert 24-hour skilled nursing care, our residents participate in a variety of therapeutic activities and enjoy home-like amenities in a warm and comfortable environment. NYC Health + Hospitals/Sea View has a specialized 38-bed unit is designed to meet the needs of individuals with Alzheimer's disease and related dementia disorders. Our team of doctors, nurses and therapists is sensitive to the challenges Alzheimer’s care residents and their families face every day. Our goal is to ensure the best quality of life while keeping you or your loved one safe and active. We ensure that our residents always feel engaged, safe and comfortable. A pioneer in long-term brain injury care, NYC Health + Hospitals/Sea View was one of the first facilities to bring this specialized service to New York State. The Center’s interdisciplinary team of medical professionals provides individualized care to each patient with the goals of restoring motor and cognitive functions, maximizing the quality of life and ultimately facilitating a transition to a lower level of care. Take a tour of NYC Health + Hospitals/Sea View on Staten Island, through the eyes of our patients and caregivers.